Several hundred supporters joined Coco Palms occupiers in a ceremony Sunday during the hour at which a judge’s order to evict a pair of Native Hawaiian activists from the property took effect. The occupiers invited the supporters into the encampment for dinner cooked over a fire. The 19th century home of Kauai’s last queen was later the resort where “Blue Hawaii” was filmed. Now a new resort is planned. WAIMEA, Hawaii – Kaho’okahi Kanuha was found not guilty by Judge Barbare Takase at the Third-Circuit District Court in Waimea. Artists rendition of the Thirty Meter Telescope. 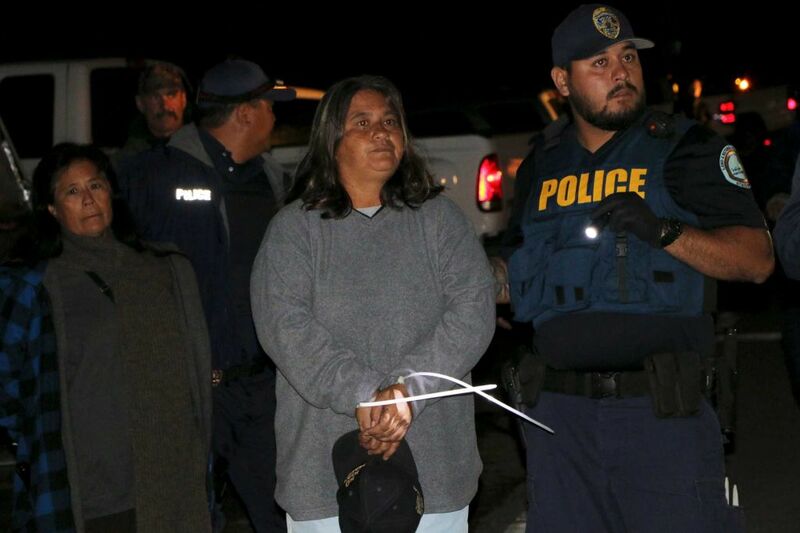 Some of those arrested on Sept 9, 2015 in Mauna Kea, Hawaii. Photo: SF Chronicle. State conservation officers arrested eight protesters on Mauna Kea early Wednesday morning for violating the state’s new emergency rules that prohibit camping on the mountain, a Department of Land and Natural Resources spokesman said. 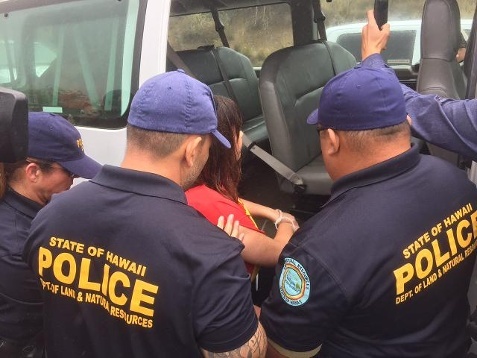 DNLR officers arrested seven women and a man at a protest camp across the road from the Mauna Kea Visitors Center for being in the restricted area on the mountain. Police begin arresting protesters. Photo: Maui Now. It seems Mauna Kea herself has joined in the resistance of the construction of the copy.4 billion Thirty Meter Telescope. On Saturday, July 18 at about 3 a.m., there was a snowstorm on top of the mountain—in the midst of one of the hottest spells some can remember in their lifetime. The protectors, dressed in sweatshirts and warm jackets, shivered against the cold and rejoiced in the reawakening and reconnection of the people and the mountain. 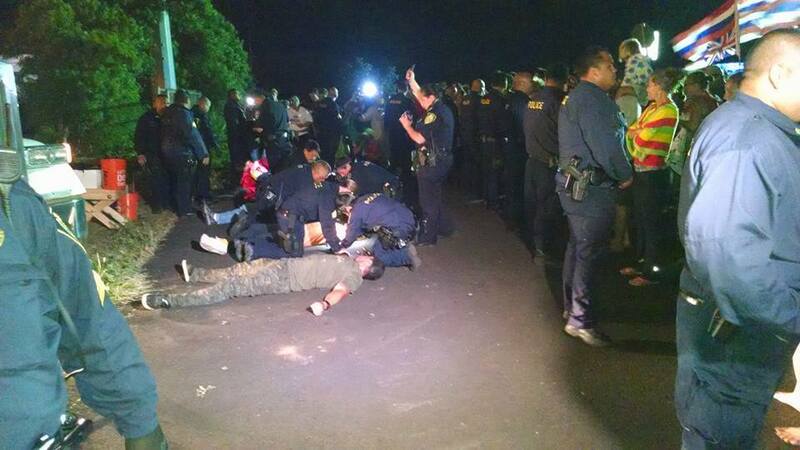 One of eleven people arrested today blockading construction of the Thirty Meter Telescope. 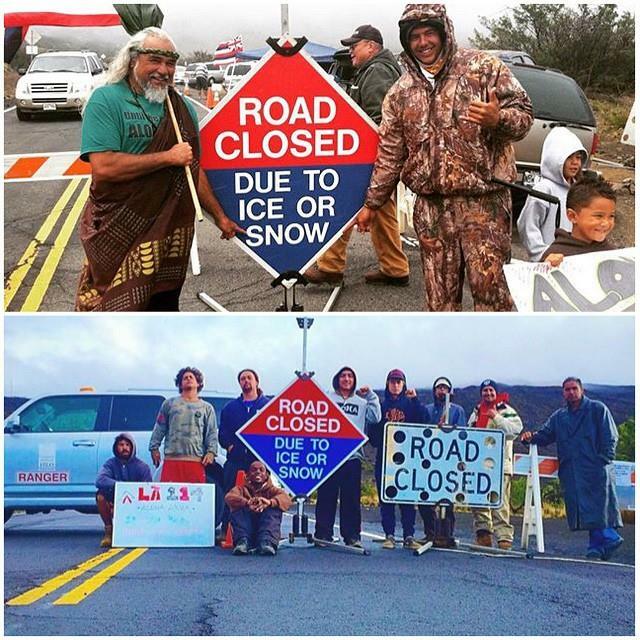 Workers trying to make their way up Mauna Kea to restart construction of the Thirty Meter Telescope were forced to turn back after protesters blocked the road to the summit with a trail of large rocks. 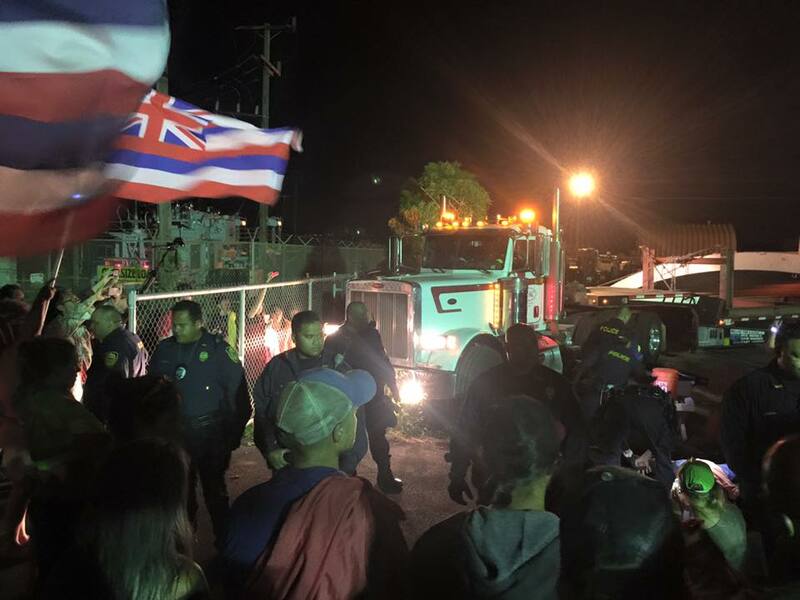 Starting early this morning, five trucks being escorted by police were stopped repeatedly by more than 300 protesters who set up about two dozen “lines of defense” across the Mauna Kea access road near the Visitor Information Station, which is located at the 9,200-feet elevation. 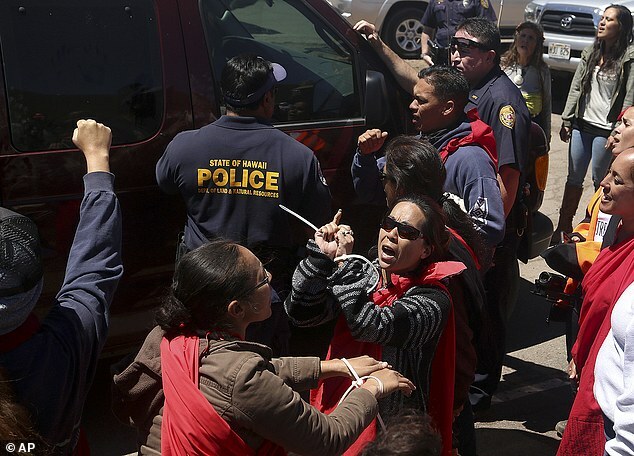 Thirty Meter Telescope protesters chant after being arrested from the telescope building site on the summit of Mauna Kea in Hilo, Hawaii, Thursday, April 2, 2015. HONOLULU – In a Tuesday news conference, Gov. David Ige announced that TMT construction has agreed to a one week halt of work at the summit of Mauna Kea.